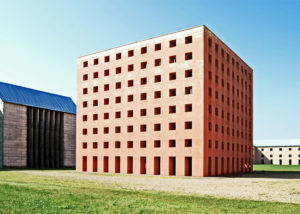 Aldo Rossi was an Italian architect and designer. 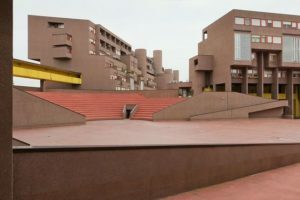 He was the first Italian to receive the Pritzker Prize for architecture. 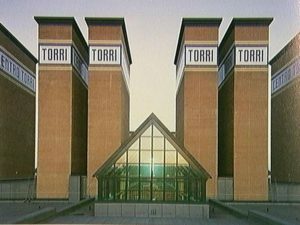 Aldo Rossi, (born May 3, 1931, Milan, Italy—died September 4, 1997, Milan), Italian architect and theoretician who advocated the use of a limited range of building types and concern for the context in which a building is constructed. This postmodern approach, known as neorationalism, represents a reinvigoration of austere classicism. In addition to his built work, he is known for his writings, numerous drawings and paintings, and designs for furniture and other objects. Rossi received a degree in architecture from the Milan Polytechnic in 1959. 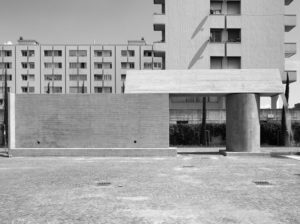 He began a nine-year collaboration with the Italian architectural magazine Casabella-Continuità in 1955, and in 1959 he opened an architectural office in Milan. During the early 1960s he began his lifelong career as a teacher. 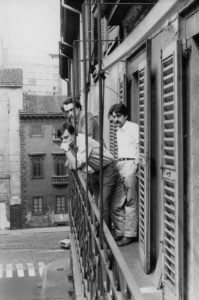 Aldo Rossi on the studio’s balcony with two collaborators, Milan, seventies. In 1966 Rossi’s research culminated in an influential first book, The Architecture of the City, which proposed a fundamental continuity between the principles of architecture and urban design. In contrast to a functionalist emphasis on political and economic forces, Rossi suggested a renewed focus on the description of the city as a constructed tangible artifact, an “urban science” founded on an important analytical tool, the concept of type. A typological system of classification was based on the identification, by formal and programmatic similarities, of archetypal urban institutions such as the courtyard, the street, and the house. 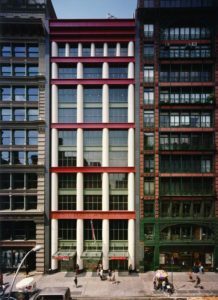 In stressing traditional urban configurations, Rossi re-established the study of architecture as a relatively autonomous discipline with a specific body of knowledge. 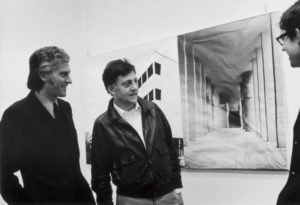 Aldo Rossi in Barcelona, early seventies. The award is an initiative funded by Jay Pritzker through the Hyatt Foundation, an organization associated with the hotel company of the same name that Jay founded with his brother Donald in 1957. The award was first given in 1979, when the American architect Philip Johnson, was awarded for his iconic works such as the Glass House in New Canaan, Connecticut. 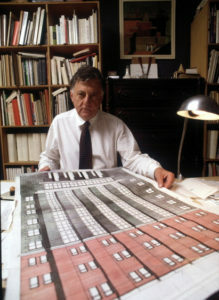 The Italian architect Aldo Rossi showing a project in his studio. Italy, 1990s. 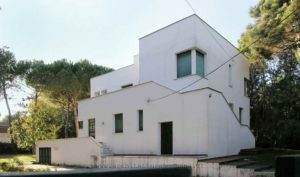 It is said quite often that initial works of Rossi had this tinge of Italian Modernism in them. An important design rule, valued much by Rossi was repetition. A repetition of basic architectural elements was quite evident in all his designs. He regarded this process as a search for the essential forms. Right from the start, Rossi had developed a keen understanding about how cities worked. The functionality of cities and their elements governed his building designs. It can be clearly seen that he treated public buildings as scaled down genre of functioning cities. Scholastic Corporation Headquarters, New York. 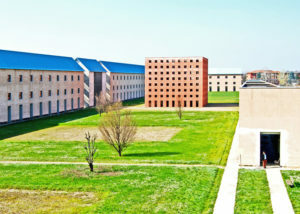 Aldo Rossi’s unfinished San Cataldo Cemetery in Modena, Italy, is considered one of the first and most important Postmodern buildings. Rossi once declared that “I cannot be Postmodern, as I have never been Modern,” yet his cemetery for Modena displays the strong colouring, bold form and historically referential detailing that became synonymous with the movement. Buildings with steel blue roofs enclose the cemetery. At the centre of Rossi’s design is a cube-shaped ossuary for housing remains and a conical tower that marks a communal grave. Set within a courtyard on the outskirts of Modena, the ossuary is covered in terracotta-coloured render, while the perimeter buildings that enclose the courtyard feature steely blue roofs. Detail of funerary niches and elevated walkways. The architect formulated his initial designs for the expansion of the cemetery with his colleague Gianni Braghieri. It was Rossi’s first major public appointment and was to bring him fame outside Italy for the first time in his career, opening doors to projects in America, Japan and in other parts of Europe. 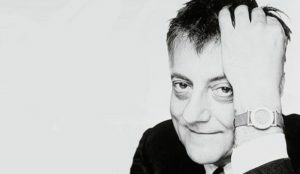 He later became the first Italian recipient of the Pritzker Prize in 1990. Ossuary cube viewed from the cemetery courtyard. 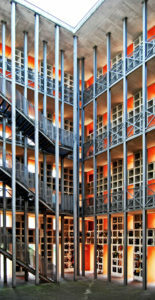 Along with all this architectural and literary work, Aldo Rossi did a sufficient justice with his title as a designer. He designed a number of objects that won him international recognition. 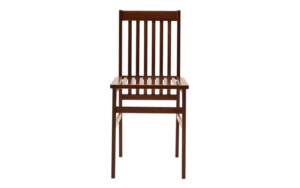 Among all these objects stands out the elegant and beautifully shaped “Milano” chair, that was made in both cherry and oak in 1988.